Everyone knows how important backups are in the digital age. Leaving hackers and cybercriminals aside, your own mistakes can cost you a lot when you do not have a backup of your precious data. Accidental deletions or hardware corruptions can happen anytime, and you may lose all your data. When you are a website owner, you not only have your data on the server but also data that is uploaded by other people. Loss of such data may be unrecoverable. This is why you need to have a complete backup of your website database. Why do you need to take regular backup of your Joomla site? Websites are often prone to hacks and crashes. The Joomla CMS comes with a backend database – MySQL or PostgreSQL. Even erroneous configurations can often wipe the database clean. Now, if you have a personal blog or some personal website, you can get back all the data, but you will have to go through the pain of configuring Joomla, installing all the extensions and plugins. One way to backup your Joomla website is to dump all the files on the server using an FTP client to a separate location. You can also export your database and download the exported file to your local PC. However, that is much work, especially when Joomla has extensions specifically designed to create backups. Here is a list of the top 5 extensions that makes taking backups effortless. Akeeba backup is an open source Joomla backup extension that makes a backup and restores intuitive and straightforward. Not only it is quite simple to use, but it also comes with a whole lot of options. Like EJB, Akeeba can also be used for making full site backups. Alternatively, you can also make selective backups. 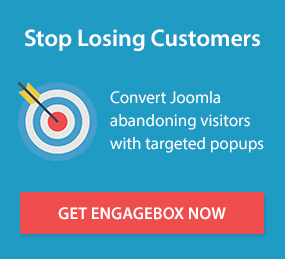 In the package, you get an installer that provides a similar user experience to that of the Joomla user. Akeeba also comes with a configuration wizard, a site transfer manager and also Akeeba Kickstart, a freely available script to selectively restore content on the website. All the core components are free of charge and do not miss out on any functionality in spite of being free. Support is not free of cost. This free extension makes an excellent no-frills backup. With this extension, you get a full data dump of your website. This includes the databases, the files, and everything else stored in one zip archive. Later, you can extract the files and restore them to the server. With this plugin, you have the option to backup only the database, only the files or both. Access control lists are also backed up with the files. The primary purpose of LazyDbBackup is to create the database backup and send it to you by email. There is an option where you can keep the backups in the server itself without having it mailed to yourself. In that case, you can get the backups via an FTP client. Offers a free and easy way to get database backups mailed to you. This can be particularly useful if someone sets up a mailbox just for the backups. It is quite an unorthodox method of implementing version control. Works only with MySQL databases. DataSafe Pro is an intuitive database backup solution. With DataSafe Pro, backup and restore operations can be done quite efficiently using the intuitive DataSafe Pro interface. You can also automate the backup process so that when you need to restore the database, you can select any one of the backups and restore it. Databases are automatically repaired and optimized during this operation. Provides a simple interface for making backups. Restore operations are quite comfortable and do not require any extra effort. Uses the superior GZIP compression. Only backs up the database. No other files are backed up. XCloner is a comprehensive website backup and restores solution that can work as a native Joomla Component. It can back up any PHP/MySQL website. It can also be used to create custom backups or to make automated backups. With XCloner, you can also store your backups on Amazon S3 cloud. For large databases, it also offers incremental backups where the changes made are backed up. It can also be used to transfer the website from one server to another. Comes with a large number of features that will appeal to power users. Support is not available freely. Maintaining a backup is an essential part of running a website. With Joomla, you get some of the best backup extensions at zero cost. Therefore, this is something that you must have on your Joomla website. Moreover, you can also automate the backup process and create incremental backups with these plugins. Depending on what you want to back up, where you want to store the backups and what features you are looking for, you can choose any one of the plugins that are listed here and install it on your website.